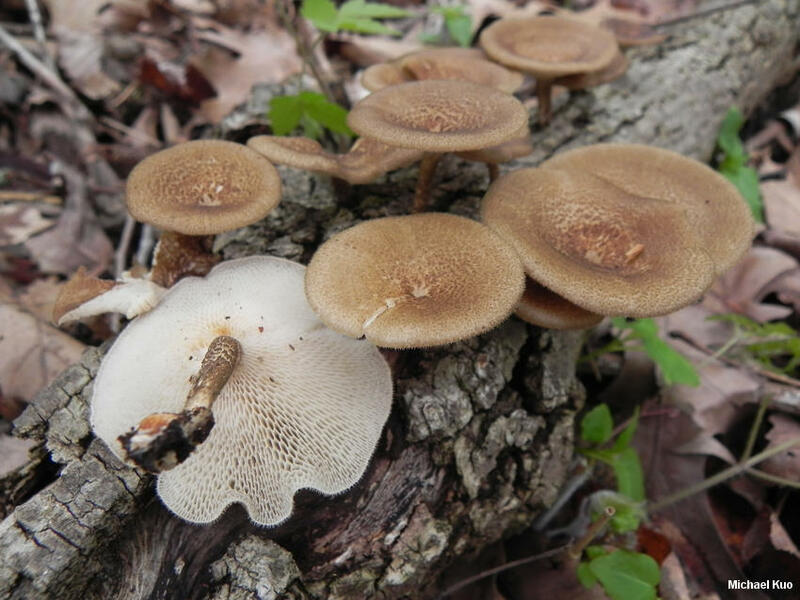 East of the Rocky Mountains, this little polypore appears on the wood of hardwoods in the spring, and is often encountered by morel hunters and turkey hunters. It is fairly small, and has a central stem, along with whitish, angular pores. The most distinctive feature of Polyporus arcularius, however, is its delicately fringed, finely hairy ("ciliate," in Mycologese) cap margin. 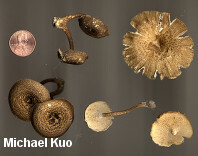 The cap color ranges from vey dark brown to pale tan. In the Rocky Mountains and in the Southwest, Polyporus arcularius appears in summer and fall, primarily on the wood of Gambel oak. 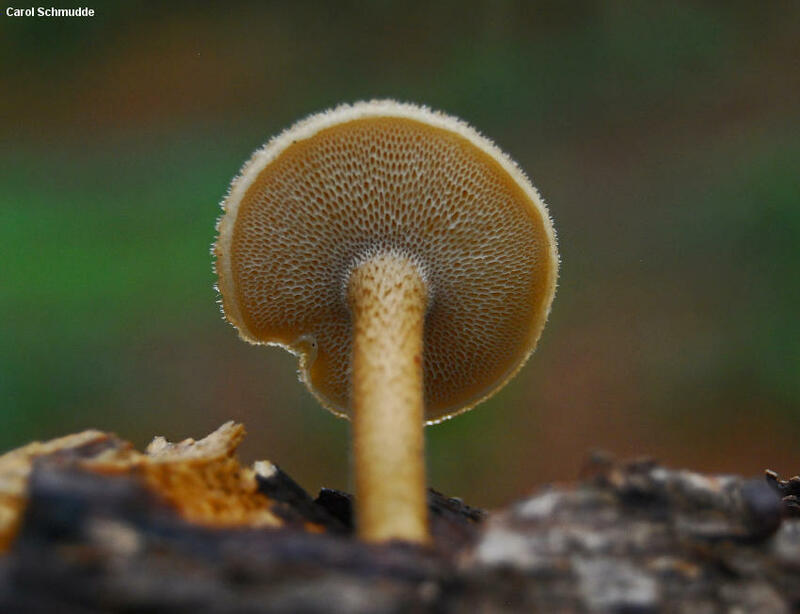 Polyporus arcularius is probably headed for a new genus in the not-too-distant future; a 2008 molecular study by Sotome and collaborators found the species, along with Polyporus brumalis, to be more closely related to species of Lentinus (which feature gills!) 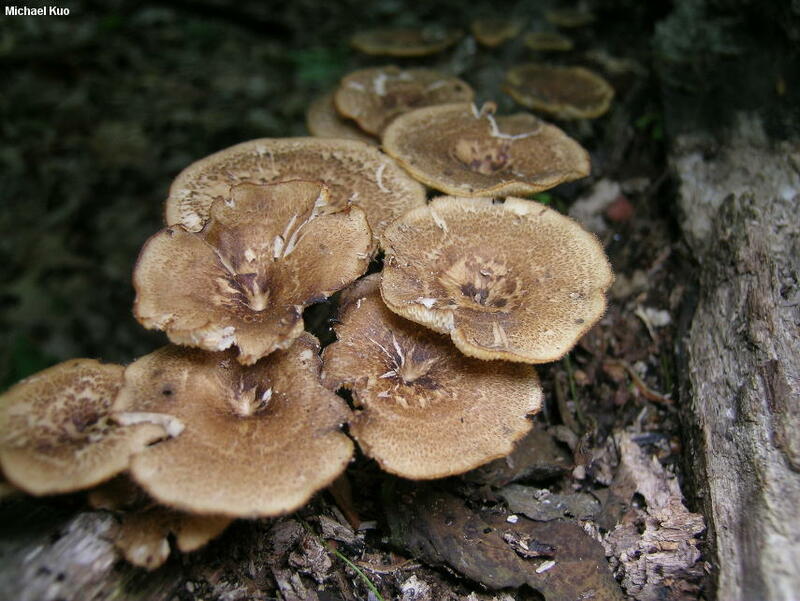 and to Daedaleopsis confragosa than to other Polyporus species. Ecology: Saprobic on the deadwood of hardwoods--especially oaks; causing a white rot; growing alone, scattered, or gregariously; occasionally arising from buried wood and appearing terrestrial; appearing in spring in eastern North America, and in summer and fall in the Rocky Mountains and the Southwest. The illustrated and described collections are from Illinois and Colorado. 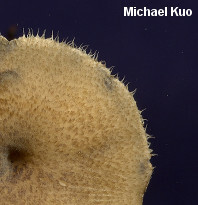 Cap: 1–4 cm; convex to flat or shallowly depressed; dry; finely, concentrically scaly with brown to golden brown scales and fibrils over a dull tan ground; the margin adorned with tiny projecting hairs. Pore Surface: Running down the stem; whitish at first, becoming brownish; pores 0.5–2 mm across, hexagonal or angular, radially arranged. Stem: Central or slightly off-center; 2–4 cm long; 2–4 mm wide; equal; dry; brown to yellowish brown; scaly to hairy; tough; basal mycelium whitish. Flesh: White; thin; tough; unchanging when sliced. Odor and Taste: Odor slightly fragrant, or not distinctive. 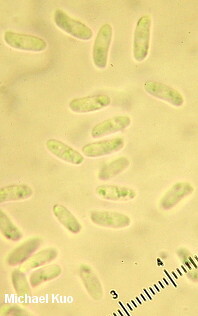 Microscopic Features: Spores 5–8.5 x 1.5–2.5 µm; cylindrical; smooth; hyaline in KOH. Basidia 27–35 µm long; 2-4-sterigmate. Hymenial cystidia absent. Pileipellis a radial cutis of brown, clamped, somewhat agglutinated elements 4–7 µm wide. Hyphal system dimitic. REFERENCES: (Batsch, 1783) Fries, 1821. (Saccardo, 1888; Overholts, 1953; Smith, Smith & Weber, 1981; Arora, 1986; Gilbertson & Ryvarden, 1987; Lincoff, 1992; Horn, Kay & Abel, 1993; Nunez & Ryvarden, 1995; Evenson, 1997; Barron, 1999; Roody, 2003; McNeil, 2006; Miller & Miller, 2006; Binion et al., 2008; Sotome et al., 2008; Kuo & Methven, 2014.) Herb. Kuo 04229503, 04309504, 05060603, 07280602.